Are you interested in using a Cycloid Dipole for your own purposes? If so, please read this. For the 2 meter beacon we started using a 2 meter J-pole - but in a service where most people listening were likely to be using horizontally polarized antennas, this was not considered to be ideal. Because a good, horizontally-polarized, omnidirectional antenna is rather difficult to construct, we held off on doing so. In the meantime, we found an antenna that offered Circular Polarization (CP). Considering that with this mode of polarization that it is unlikely that propagation conditions may be encountered that would make the circularly-polarized signal favor either a horizontally or vertically polarized antenna, we decided that it would offer the best of both worlds. The downside? Circular Polarization, when received on a linearly-polarized antenna (i.e. vertical or horizontal), will typically suffer an apparent 3db decrease in signal - but this is a lot less than one might experience under cross-polarized (that is, a vertical transmit signal on a horizontal receive antenna) conditions. The thought is that with the propagated polarization being somewhat randomized, at least some of the "fade" that one experiences when using linearly-polarized antennas on each end of the path is likely to be due to cross-polarization loss - and this effect is circumvented with the use of CP. Although the companion 6-meter Cycloid Dipole was constructed soon after the 2 meter version in about 2001, it was never fully completed, laying around and developing a nice, dark patina. The reasons that it languished for so long had to do with the fact that the J-pole was working just fine and that after it was constructed, the 6-meter antenna with its 1/2" diameter copper water pipe was not strong enough to properly support itself like the 2 meter version and would this require additional structural support. In 2015 it was noticed that the 6 meter beacon's signal had dropped off by several S-units and subsequent investigation revealed that the measured VSWR at the transmitter was on the order of 5:1 and that the reduction in signal strength was not only due to the loss of efficiency, but also due to the fact that the power control servo circuit in the beacon itself was detecting this reflected energy as transmitted energy and dutifully reducing the transmitter output power. A further investigation showed that there was infinite DC resistance across the antenna terminals - which should not have been the case for a J-pole! Because signal was being radiated it was naturally assumed that the ground (shield) side of the feed coax had broken loose somewhere. Since the beacon had likely been operating in that state for several months by the time we'd discovered it, we simply left it alone for the time-being and set about finishing the construction of the 6 meter Cycloid. As can be seen in the picture lower down on the web page a number of supports were added to antenna's elements to keep everything mechanically stable - especially important since the spacing of the transmission line section comprising the matching network needed to be maintained in order for there to be a good match at the operating frequency. As with the 2-meter Cycloid, a rain shield was also placed over the matching network and feedpoint of the this antenna to keep it from being detuned by snow and ice during the winter months. Taking the lesson learned from the 2 meter version, this was also fed in balanced fashion using a 1:4 coaxial half-wave balun to assure symmetry, the precise feedpoint and shorting bar being appropriately placed on a half-wave parallel transmission line - also constructed of 1/2" copper pipe, just like the 2 meter version. 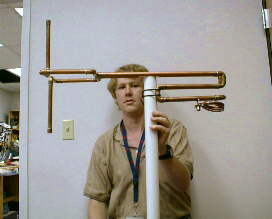 As can be seen from the picture below, there are pieces of white Delrin (tm) plastic used to support and maintain the separation of the portions of the tuning section of this antenna, but you might also notice that there are also two pieces that are in the middle of the tuning section, one above the other. These are actually dielectric tuning elements used to "fine tune" the antenna to achieve the best match at the operating frequency - which is a lot easier than unsoldering the shorting bar and/or the feedpoint attachment! Because the rain shield slightly affects tuning (the frequency of optimal match is lowered slightly) the short and feedpoints are soldered after its installation and then the plastic pieces (there are actually three - the two on the upper portion, in the middle, ended up together) are slid back-and-forth and then secured in place with dabs of RTV (Silicone (tm)) adhesive to keep them from moving about. 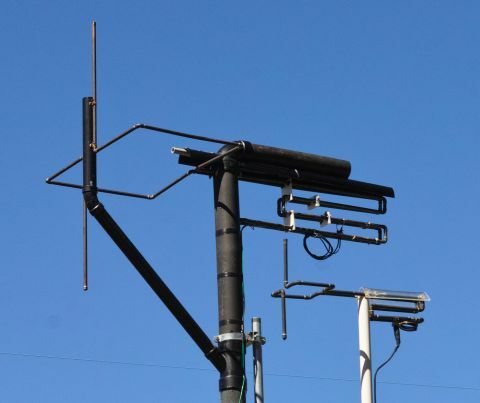 This new antenna was initially tested on September 19 and finally installed in its permanent location on September 20, 2015 and it was reported by at least one station approximately 75 miles (120km) distant and over several mountain ranges using a horizontally-polarized Yagi that signals had improved by more than an S-unit. During the final installation we also discovered that while the antenna itself had a good match at the transmit frequency, the match at the transmitter was terrible, leading us to discover that the outside copper shield of the Heliax (tm) feeding it had work-hardened and fractured due to constant vibration over the years, separating it from the connector and that the old J-pole was just fine! The CP antennas that we are testing are Cycloid Dipoles constructed of 1/2" rigid copper tubing (See photos, below) with each one being constructed similarly. While it may not be obvious from the picture, the antenna itself (the part on the far left) is fed with a balanced line/matching network consisting of parallel 1/2" copper tubing. Most of the structure (from the part where the "balanced line" begins and everything to the right of it) is just the matching section - A stub-tuned 1/2 wavelength balanced line. The advantage of the 1/2 wavelength stub-tuned line is that it can be used to match almost anything at all. The obvious disadvantage of it is its size: On 2 meters, you need about 2 meters (about 6 feet) of tubing just to construct a matching network. In our case, using a line constructed of large-diameter air-dielectric copper tubing made for a very low-loss matching network. It is possible to use lumped-constants (e.g. coils and capacitors) to effect a match - but these may be lossier and more "fragile" in terms of power handling capability. 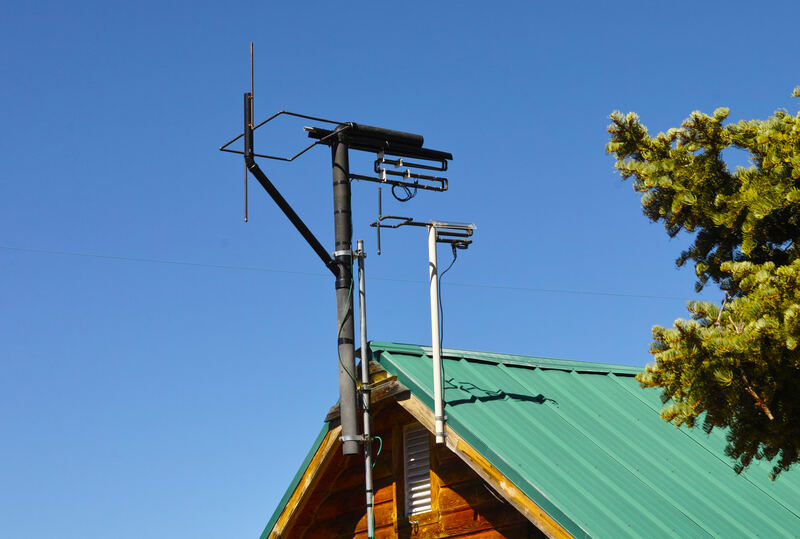 While we believe that we have come up with a somewhat "simpler" scheme to match the antenna, seeing how well the antenna has survived over time and through several winters has made us reconsider whether or not it would really be "better" or not. At the bottom of the antenna on the far right (in the picture) may be seen the 1/2 wave coax (not choke) 4:1 balun used to transform 50 ohm unbalanced to 200 ohms balanced: The antenna could have been fed directly with 50 ohm coax at a different tap point (using a coax "choke" balun) but the 4:1 balun seemed to be much better-behaved and, unlike the 50 ohm "choke balun" arrangement originally tried, completely insensitive to coax orientation - a good indication that the feedline is not doing radiating of its own. What is a "Cycloid Dipole?" The term "cycloid" means "resembles a circle." The actual antenna, however, is clearly rectangular - so why the name? Ideally, the "horizontal" part of the antenna would be circular (see the drawing below) but anyone who has done any sort of construction that requires bending tubing already knows that without the proper tools and materials, making accurate, repeatable circular bends is extremely difficult. It is for this reason that a rectangular radiating element was used, constructed using simple straight sections and right-angle connectors. According to computer simulations, performance is no different from what it would be were it circular - provided that the antenna's proportions are re-sized appropriately. Note: This diagram is drawn as viewed from slightly "below" the antenna to show the nature of the ring section. If this antenna performs as predicted (in free space) it will have about 1.8 dBic (db gain above an "isotropic" circular antenna, or about -1.2 dBi. Remember that we will experience an apparent 3 db gain reduction when the receive antenna is linearly-polarized) and have an ellipticity ranging from 1.05 to 1.25 and be uniform in gain to within 0.5 db anywhere on the horizon. In real life, of course, performance will likely be somewhat worse - owing mostly to the fact that it cannot practically be mounted in free-space and there will inevitably be some effects from the matching network and feedline, but we can hope that it is somewhere in the ballpark. The 2 meter antenna was "temporarily" installed in early fall of 2001 and as of today, it is still in service. As can be seen from the picture below it is mounted on the eve-end of the roof on a piece of stout PVC pipe. As you can also see from the picture (see the one below) a piece of clear plastic (1/4" thick Lexan (tm)) has been formed to shield the "trombone" matching network from accumulation of snow and ice. This "temporary" installation seems to have become more permanent, and over the years the beacon has been heard numerous times in Northern California via Meteor Scatter. There was also no indication (from afar) that the antenna was ever adversely affected by snow or ice accumulation (but no VSWR readings were taken, either...) While we have yet to find someone with switchable circular polarization analyze the signal, we have had an amateur with a "polarization rotator" (that is, a rotator that will physically move the antenna between horizontal and vertical polarization) listen to the beacon - and he can tell no difference in signal strength as the polarization is shifted. It is worth noting that this person is receiving the signal via a path with multiple knife-edges and bounces and at a distance of about air 75 miles. It is absolutely fair to say that the design of this antenna was inspired by commercially-available low/medium power FM broadcast antennas. This sort of antenna is somewhat well-known in the FM broadcasting world as a "Ring and Stub" design (a term used to describe ERI's antennas, for example.) A link containing pictures of some broadcast-band antennae - including a "ring and stub" may be found here - and if you are really interested, you can do an internet search and come up with a few more examples. For obvious reasons alluded to previously (see the sidebar) it was decided that the "horizontal" portion of the antenna would be rectangular instead of round. So, from pictures of similar commercial antennas, a "rectangular" antenna was laid out using the approximate proportions of the "round" ones. Then, computer-aided antenna analysis was brought to bear. The primary design tool was NEC-2, a program with a very long lineage and one that, when used in detail, requires a fast computer with a LOT of memory if one doesn't wish to spend eternity trying various configurations. Note: Using this program is very awkward and is far beyond the scope of this document - if you wish to obtain more information on NEC-2 or other antenna analysis software. One resource of information is WB6TPU's "unofficial" NEC Archive. Of course, one can also do an internet search. Note: I am not a "NEC" expert, so please do not ask me any questions about it. Another useful antenna analysis program is Makoto Mori's MMANA program. This program is based on the MININEC model and is not nearly as powerful as the full-blown NEC variants (e.g. it doesn't "know" about circularly-polarized antennas.) However, it provides excellent agreement to NEC in terms of radiation patterns and their horizontally and vertically-polarized components, as well as having a much easier-to-use graphical interface. In broad terms, if the radiation patterns of the horizontally and vertically polarized components are of the same magnitude, one can generally be assured that the antenna is reasonably well-behaved in terms of the circularity of its radiation. The 6 and 2 meter cycloid dipoles, as installed. Note the rain shield covering the rear portion of the matching sections along with the 1/2 wave coaxial cable delay line comprising the 200 ohm balun on each antenna. Although not obvious from this picture, the two antennas are actually separated both horizontally and vertically. At this point a lot of experimentation was done with the proportions of the antenna elements - always keeping the antenna symmetrical. After experimenting (on computer) with various physical parameters for a while, one gets a "feel" for how different physical parameters affect the radiation pattern and the polarization properties - so eventually, a design was derived that, in simulation, had excellent properties (e.g. uniform omnidirectionality at the horizon, good axial ratio, etc.) The only problem was that this antenna was still in the 31 MHz area. A linear rescaling of the antenna was done to put it at approximately 50.1 MHz and it was immediately noted that this antenna design did not lend itself to rescaling in that manner. Because of the recent experience, having the "feel" for how the antenna's proportions affected its performance allowed relatively painless manual tweaking of dimensions. The antenna was then scaled again (using prior experience - as well as the "feel") to 144.3 MHz. You might ask "Why 144.3 and 50.1 MHz instead of the FM band?" The answer is that this antenna was being designed specifically for use with the beacon. The radiation pattern of the 6 meter version of the antenna, as predicted by the MMANA program is shown below. (Note: This antenna has been constructed and tested, but not "ruggedized" or installed.) As mentioned, MMANA does not "know" about circular polarization - but in testing with an antenna analysis that does know about it (NEC-2) it has been determined that, in general, there is good agreement between the two - as far as MMANA goes, anyway. The plot shows the predicted antenna pattern for the 6 meter cycloid, the center of which being mounted 7 meters above a "real" ground (that is, not a perfect ground, but a "typical" lossy ground. The left-hand plot shows the horizontal pattern of the antenna (as if viewed from above) at the elevation of peak gain (11 degrees) while the right-hand plot shows the vertical pattern at an orientation corresponding with the peak gain. Note that, under these conditions, there is more energy in the vertical plane than in the horizontal plane, but that both fairly well-behaved omnidirectional patterns. It is also worth noting that at higher elevation angles, the "circularity" of the pattern predictably decreases, with only the "horizontal" energy remaining directly overhead. In the real world, any antenna's pattern will be skewed by nearby objects - including the earth below, the mast supporting the antenna, and even the metal of the coax feeding the antenna. Typically, the gain will be somewhat reduced (especially in the vertical plane) in the direction of the mast and somewhat enhanced in the opposite direction - precisely the effect expected when side-mounting an antenna. Because the antenna must be mounted/connected to something this effect is unavoidable. As with pure vertical antennas, the effect becomes more dramatic as the spacing between the supporting mast and the antenna approaches 1/4 wavelength. Keep this in mind if you are trying to obtain either the best omni pattern - or if, in fact, you are intending to throw more gain in a particular direction! A note about the feedpoint impedance: If you look at the pattern plot, note that the predicted feedpoint resistance is about 18 ohms resistive with the reactance being at about +J300 ohms. While this value hasn't been measured directly, we have measured the locations actual tap positions on the 1/2 wave matching network and have determined that, in fact, the empirically determined tap locations do correlate well with those numbers! Now, you see why we are using a 1/2 wave "open wire" matching network! The patterns of the 2 meter antenna looks similar. Keep in mind that the pattern shown is for a 6 meter antenna at about 7 meters (21 feet or so) - or about 1.17 wavelengths off the ground. At 2 meters, a similar pattern would occur at about 1/3rd that same height - at 2.3 meters. The presence of the ground tends to "squash" the pattern vertically somewhat. This has the effect of increasing the gain near the horizon as the expense of overhead gain. Because we want more gain at the horizon (in this case) we don't complain. The closer to the ground, the higher (generally) the "takeoff" angle will be. For the example, peak gain is at 11 degrees elevation. The farther off the ground, the more "spikey" the pattern will also become. In free space, this eventually becomes a smooth pattern. The above statements are true for about any type of dipole antenna, and not just this one! If, using a balanced line, you feed a signal into two equal-sized and equal-length conductors that are not parallel to each other (i.e. not just more balanced line) then a signal will radiate from those added conductors. If they diverge from each in opposite directions, it begins to resemble what is commonly called a dipole. It just so-happens that when the total length of those two conductors is approximately 1/2 wavelength, the feedpoint impedance can come close enough to 50 ohms to be useful without requiring a matching network. If these two elements are both lying horizontal, then the polarization of the antenna is, in fact, horizontal. Likewise, if that antenna is rotated so that the two elements are vertical, then so is the polarization. If you were to put one element vertical and another element horizontal, then some amount of signal would be radiated in the vertical plane, and some would be radiated in the horizontal plane. In the case of the half-wave horizontal dipole, it is important to note that signal is radiated broadside to the wire - but not off the ends and therefore, the horizontally-polarized half-wave dipole is not an omnidirectional antenna. The radiation patterns of the 6 and 2 meter cycloid antennas as predicted by MMANA. See the text for a brief explanation of the patterns. Now, what if you were to form that horizontal dipole into a ring - but not with the ends touching? Would it then be omnidirectional? The answer is: No, not quite. True, the nulls off the ends of the antenna will greatly diminish, but radiation in all directions will not be equal. Why? It is because not all "segments" of the wire of which the antenna is constructed will radiate equally. For instance, the segments of wire near the feedpoint will (for a 1/2 wave dipole) have a lot of current but relatively little voltage while the very ends of the dipole will have a lot of voltage but little current. The distribution of the current and voltage that have a marked effect on how much a particular "segment" of wire will be able to radiate. If you were to alter the shape of that "ring" so that its aspect presented more of those segments of the wire that did little of their own radiating in directions that needed more signal - and that less of those segments that do more radiating were presented in those directions where there had been too much signal, then one could conceivably make the antenna present a pattern that was more omnidirectional in nature. Another way to help achieve this goal is to change the fundamental current distribution of RF along the conductor, and one way that this can be done is to change the length of the conductors - but doing this also means that you will not likely end up with a nice match that is anywhere near 50 ohms, either. By changing the length of the conductors - and its shape - you can go a long way toward forcing a more equal radiation from various segments of the antenna. How about circular polarization, then? Circular polarization is more than simply horizontal polarization PLUS vertical polarization - and it is neither. A circularly-polarized wave front literally "screws" its way through the air, constantly rotating, and like a screw its rotation could be either clockwise or counterclockwise. In the same way that one experiences cross-polarization attenuation when receiving a vertically-polarized signal on a horizontally-polarized antenna, one will also experience a similar loss if one tries to receive a clockwise-polarized signal on a counterclockwise-polarized antenna. Receiving a circularly polarized signal (of either polarity) on a linearly-polarized antenna (of either polarity) will result in half of the signal being lost, or 3db. One can use both horizontally and vertically polarized elements to create a circularly-polarized signal: Crossed Yagis are a good example of this. With proper phasing (i.e. delay), symmetry and given equal-amplitude signals feeding both sets of elements, one can use a set of vertically and horizontally polarized elements to impart a "spin" on a wave front. A roughly similar thing happens with the cycloid dipole. A diagram of this type of "cycloid" dipole. Note that most of the "antenna" is not antenna at all - but the 1/2 wave balanced-line matching network. Note: The mechanical configuration shown causes this antenna radiate a signal that is Left Hand Circularly Polarized (LHCP) - to change it to RHCP (Right Hand Circular Polarization) simply make the vertical element that points up in the picture above point down and vice-versa. What is not so obvious is the fact that all of these elements of design work together: The vertical portions greatly affect the current flow in the rest of the antenna. The proportions of the lengths of the sides of the rectangle will also affect how much signal will be radiated by that side: Make a side shorter, and it will (likely) radiate less signal in the direction broadside that that side. Obviously, the vertical spikes radiate energy in the vertical plane - but they also affect how much energy will be radiated horizontally as well. For example, if they were very tiny, then they would radiate very little energy - and the rest of it would be radiated in the rectangular, horizontal section. If they were very large, it might be that they would radiate too much energy and overwhelm the rectangular horizontal section. There is also a more complicated aspect of everything: It is not enough just to make the vertical and horizontal elements both radiate a signal - or even equal amounts of signal: In order for the resulting signal to be circularly polarized the phase relationship between the vertical and horizontal portions must be (in the far field) maintained appropriately. This implies yet another set of interactions: The amount of phase difference between the vertical and horizontal sections depends on the overall length of the horizontal conductor: If it is too far off in either direction, then the "circularity" of the wave front is compromised - and that doesn't take into account that omnidirectionality is also likely to be affected as well. Yes, the antenna is, in its simplest form, a dipole. No, it is NOT resonant at its design frequency such that its feedpoint resistance is anywhere near 50 ohms resistive. Precise dimensions and proportions are crucial to proper operation. No, it does not easily proportionally scale with frequency. A drawing showing the dimensions of the antenna may be seen to the right. Diagram of the "cycloid" dipole. Dimensions are given for both 6 and 2 meter beacon subband frequencies. Click on the image to get a full-sized version. Only 1/2 inch copper water pipe may be used with the dimensions given. We used copper, as it is easily soldered (using lead-free silver-bearing solder - which is very strong) and is of adequate mechanical strength. If you use anything other than 1/2 copper water pipe, do not expect the antenna to exhibit anything resembling an omnidirectional pattern with a good circularly-polarized wavefront! More than most other antennas, precise attention to detail is very important. If you wish to construct the antenna from, say, 3/4 inch copper pipe, all dimensions of the antenna may have to be re-determined. 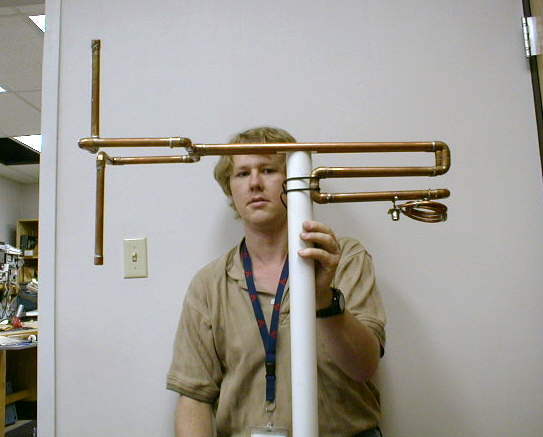 For the 2 meter antenna, 1/2 inch copper water pipe is more than strong enough to support the antenna if mounted as shown in the photographs. We have determined that it, alone, is not adequate for the 6 meter version without additional reinforcements as may be seen from the picture. As you probably figured out, this antenna is constructed using straight sections of 1/2 copper pipe, a lot of 90 degree elbows, and an end-cap for each of the vertical elements. IMPORTANT NOTICE: The dimensions given are taken from the center of the conductor where appropriate. For example, dimension "A" is used to calculate the dimension of some of the horizontal sections (e.g. the "B" pipes) while dimension "C" would be measured from the "center" of one of the 90 degree elbows to another. Why aren't actual length of pipe given in the drawing? As it turns out, different 90 degree elbows by different manufacturers have different internal dimensions - so unless you were to somehow get the exact type of elbows that we used, the dimensions would be wrong. For this reason, it is suggested that you buy "contractor's packs" of elbows so that you are guaranteed to get identical units. An obvious exception to the "centerline" rule would be the end caps of the vertical sections: Since the elements end at those points, you would, in fact, measure from the flat surface of the end caps. You'll note that dimension "A" is too close to use conventional 90 degree elbows and a straight pipe section. You'll have to cut off a portion of the elbows (if you use a 1/2 wave matching section) to get the spacing required. Yes, this is a pain, but we wanted that parallel portion to be a piece of transmission line and not part of the antenna (that is, radiate) so the closest practical spacing was used. Either Right-Hand or Left-Hand circular polarization may be chosen. The construction drawing depicts an antenna using LHCP (Left-Hand Circular Polarization) - but the antenna could also have been built for RHCP. The difference? It all depends upon which "vertical" element is up, and which one is down. A simple rule: If you are standing behind the antenna (i.e. the vertical elements are the farthest away) if the "Right-Hand" element is pointing up, then it is "Right-Hand" Circularly polarized, and vice-versa. If no-one is using a circularly-polarized antenna to receive the signal (i.e. for beacon or repeater use) then the "polarity" doesn't matter. If you are using multiple antennas in a phased array, make sure that they are all constructed identically. As mentioned before, these antennas to not scale well over large frequency ranges. Also, their bandwidth over which they exhibit reasonable circularity is quite narrow. Nevertheless, if you wanted to use one of these antennas on, say, 147.30 MHz, you could linearly scale the dimensions to that frequency and expect it to work, as a linear extrapolation would be expected to be "close enough." Before anyone asks: Do not even ask for dimensions for such an antenna to be used in the FM or TV broadcast bands: Deriving dimensions for these antennas is quite time-consuming - sorry (see below). These antennas have not been tested on an antenna range. The claims made are based on computer predictions of antennas in free space. The fact that two different programs predict very similar results improves the confidence that these predictions are likely to be correct, but one has to keep in mind the inevitable distance between predicted and actual results. Field testing of this antenna has yielded nothing that would give cause to question the validity of the antenna predictions and simulations. This testing appears to show that the antenna is, in fact, quite omnidirectional in nature and that it has no obvious tendencies toward either vertical or horizontal polarization. Because this antenna is non resonant, it is entirely due to the matching network that it is usable at 50 ohms. In fact, the matching network used is a stub-tuned 1/2 wave type - a matching network that is capable of matching nearly anything! While the matching network may allow the antenna to be tuned for nearly any frequency, the actual "circular polarization bandwidth" of the antenna is really quite narrow. For example, if you tune the 144.3 MHz antenna to, say, 147.2 MHz, it will work - but its properties of being omnidirectional and circularly-polarized may suffer considerably. For example, these properties being to fall apart rapidly when one gets more than 1 MHz away from the design frequency (at 2 meters, anyway.) If you wish to use the 2 meter cycloid for another frequency in the 2 meter band (or the 6 meter antenna for another 6 meter frequency, for that matter...) then you can probably get away with a linear rescaling of the critical dimensions. Because you are only moving a few percent, such a slight change will probably work just fine. Having said this let me be point out that it is likely that the influence of nearby objects and the ground (e.g. the fact that the antenna is not located in free-space) are as likely to skew the patterns and performance as the use of the antenna on a frequency slightly different from its original design. It is worth reiterating that the antenna described is NOT well-suited for wideband operation such as video: The type of matching network described (the 1/2 wave matching stub) will have a bandwidth that is TOO NARROW to work effectively with a television signal. Also, as much as one would like to be helpful, request for dimensions for specific, custom frequencies cannot be honored! Why? The first problem is that many hours were spent in the first rounds of antenna simulations (for the 6 meter version) before satisfactory results were obtained. Once a 6 meter version was successfully simulated, the 2 meter version of the antenna was simulated - using valuable experience gained in operating the program and getting the "feel" of how the various antenna elements interacted - and then the 2 meter prototype was built, successfully tested, and then installed. Remember, however, that if you are going to build one of these antennas for use on another frequency in the 6 or 2 meter band, you can, in fact, do a linear rescaling of the dimensions shown, as the changes are very minor - only a few percent. That method will not work as well for major frequency excursions, such as into the FM broadcast or TV band! Because several years have passed since the work on the antennas were done, it would take some "reinventing the wheel" to get back the familiarity of the software to, once again, simulate the antennas and "get the feel" for how their various design elements interacted with each other - something that would, no doubt take a number of hours. However, because dimensions of sample antennas are presented here and because the software used was free (a version of the "NEC2" software was used - easily found on via a search of the internet) it is perfectly reasonably that YOU can begin to simulate and modify antennas on your own. Remember: If we did it, you can too! Thomas's observations are greatly appreciated and it is always nice to have an unrelated party come along, do their own calculations, and come up with similar answers - Thanks!